The Venerable Bede (673 - 735) refers to a place called 'undalum' in his 'Historia Ecclesiastica' in 731 A.D., and this is the probable original of the name Hundal(l), Huntall and Hundell. The modern town of Oundle in Rutland (now Northamptonshire) shows it in its most recent spelling. In fact the name is Tribal, although its original pre 7th Century Olde English meaning is 'the undivided', and presumably referred to an area of land occupied by the 'Undals'. The intrusive 'h' is a late medieval addition connected with the dialectual change as name holders moved between areas. Examples of the recordings include Ann Hundel who married Thomas Rogdale at Walkington, Yorkshire on December 2nd 1748, Christiana Hunsdell, christened at St. Mary le Bone, on December 16th 1826. 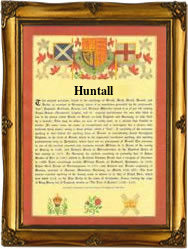 The first recorded spelling of the family name is shown to be that of John Hundall, which was dated February 9th 1674, married Margaret Tayle at Kippax, Yorkshire, during the reign of King Charles 11, known as the Merry Monarch, 1660 - 1685. Surnames became necessary when governments introduced personal taxation. In England this was known as Poll Tax. Throughout the centuries, surnames in every country have continued to "develop" often leading to astonishing variants of the original spelling.